In the wild rapids of the Niagara River, fearless canoers battle the water and each other to collect gems along the riverbank. Of course, the most valuable gems are found furthest down-river, close to the waterfall. Yes, there is a waterfall, and careless canoers can fall over the waterfall. Also, players must return collected gems to land in order to be counted. At the end, the player who collects the most value in gems is the winner. Players play on a 3D board, representing the Niagara River and the falls. Canoes float down the river as the river flows, but players can row their canoes up-river or down-river to collect gems, to return them to shore, and to avoid the waterfall. This game is great fun for the family, but is strategic and gives players the chance to plan and steal from one another. 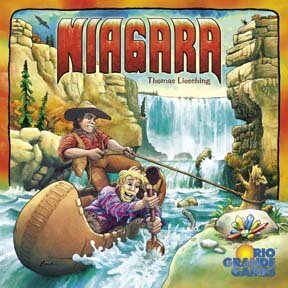 Other products in the "Niagara" series. This was my husband and my first exposure to Eurogames. It is a great introduction game because the rules are simple, and yet you need strategy to get the stones while avoiding the river. Because of the changing river I wouldn't say the game is predictable, which is good. This game has beautiful components and looks very attractive during play (moving water and boats) - and it is fun! The best thing about Niagara has to be the moving water mechanism. When the game is set up, it looks stunning, and adult and children alike are fascinated by the way the water really moves along and flows over the edge of the waterfall - along with any unfortunate boats that get too close to the edge. Components are increadible and the gameplay is not just for children - it is actually a good game of planning and calculated risk-taking.